The north side of the main building at Thunder Mountain Park. Thunder Mountain Park in Imlay, Nevada is a marvelous collection of stone, found objects and concrete constructions, buildings, figures, walkways and fences. The place borders the south side of U.S Interstate Highway 80 smack in the middle of northern Nevada. 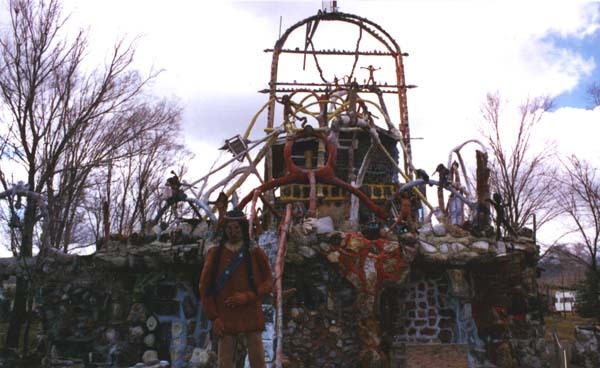 Frank Van Zant, (1920 -1989) also known as Chief Rolling Mountain Thunder, built Thunder Mountain Park with the assistance of many people over many years. The main home is no longer occupied. The grounds and constructions are in serious need of repair and maintenance. If you happen to go to Thunder Mountain Park, be sure to leave a donation in the big metal box at the beginning of the walkway that takes you on a tour through the grounds. 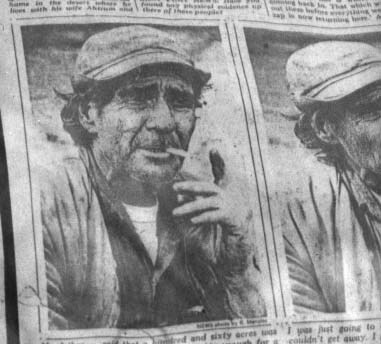 Photos of Frank Van Zant (aka Chief Rolling Mountain Thunder) from a Salt Flat News, May 1975 newspaper clipping on display at Thunder Mountain Park. The Salt Flat News story and photos are by Richard Menzies. A film by Allie Light and Irving Sarif provides an intimate glimpse of Van Zant's life and family when they were still living in the main building. The film leaves viewers with an idealized impression that is not validated by all who were there at the time. A short documentary by Trent Harris made during the 1970s provides additional insights and makes it possible to see the evolution of the project over the years. 1. "A Roadside Chat with Chief Thunder", by Richard Menzies, Salt Flat News, Wendover, NV, May 1975. 2. "Rolling Mountain Thunder", Nevada Magazine, Vol. 36, No. 2, 1976, pp 40-42, author: Bill Childress, . 3. "Visions of Home: Preserving America's Folk Art", Whole Earth Review, No. 52, Fall 1986, p.108, author: Jocelyn Gibbs. The print references were located thanks to the research efforts of Rebecca McCartney. If you have any additional information or know of other resources about Thunder Mountain Park or Frank Van Zant, please contact us.